You will get a comprehensive listing on the website as well as a full A4 display advert in the new boat sales section of the chandlery. Website advertising is the choice of many so we understand that to get maximum exposure for your vessel, we need a good web presence. All boats that we broker will be advertised as a "Classified Advert" on EBAY (probably the biggest market place in the world) as well as on our own site. We are able to offer brokerage from a variety of locations, however best results are gained from bringing your vessel to us at Selby Boat Centre where we can offer viewings in your absence. If you have moorings elsewhere, we are still more than happy to oblige. We have sold a number of boats and are actively expanding this area of the business to provide a grade "A" brokerage service. We offer 2 months Free Storage on Hard Standing whilst your vessel is up for sale, however we can also store your vessel on the water if required, although this will be chargeable on a monthly basis at our standard rates. 10% - Small items e.g. Outboards, Tenders etc. Commission rates are fixed as per the above unless otherwise agreed with the broker. Any vessels moored on Selby Boat Centre's premises must be insured for a minimum £2,000,000 third party liability and cover must be maintained at all times when on the premises. The vessel must be accepted by the broker and the price mutually agreed. It is not in either parties interest to attempt to sell an overpriced vessel. The vessel will be offered for sale for a minimum of three calendar months. Thereafter, the agreement may be terminated by either party as set out in the brokerage instructions paperwork. Storage will be charged from the inception of the brokerage agreement. 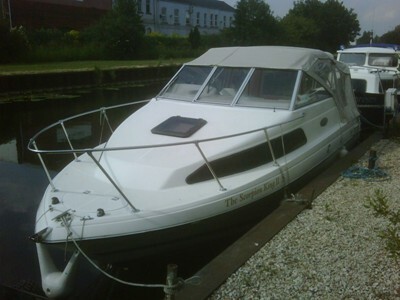 The charge will be as per the standard mooring charges of Selby Boat Centre. Upon completion of a successful sale, up to 8 weeks storage will be refunded upon final payout. The vendor will be responsible for all costs involved in removing or placing the vessel to or from the water if necessary. The broker will assist at no further charge for viewings, river trials, handovers and arranging other professional bodies as required. All vessels must be in a 'clean and tidy' state for sale. A dirty unsightly boat will not sell. The broker reserves the right to carry out a valet on any unsatisfactory vessel and charge the vendor accordingly. Any loose items must be stowed safely. Any structural, mechanical or material defects MUST be disclosed to the broker upon agreeing brokerage. Any financial interest by a 3rd party must be disclosed to the broker upon agreeing brokerage. Proof of VAT status paid will be required for any vessel capable of being used outside of the UK. Any vessel sold privately whilst on brokerage with Selby Boat Centre or removed from brokerage for this purpose will still be liable for the full brokerage fee. You have decided that you are making the great leap into buying a boat ! Here at Selby Boat Centre, we are able to offer help and advice on what to buy, how to buy and when to buy it. Over the years we have helped a number of people purchase their "Dream" boat, including a number of repeat customers. a) Budget - How much do you have to spend? b) Useage - What do you want out of your boat and where do you intend to use it? c) Who - Who is going to use the boat? and how many people do you intend to have as your crew/passengers/guests? d) Mooring & Upkeep - Where are you intending to keep the boat? Where will you have repairs and maintenance done? Once you have the answers to these questions, you can begin the search for you "Dream Boat". Boats are always being bought and sold, so don't rush into buying the first boat you see. If you miss the boat of your dreams, don't panic, there are plenty more out there! i) Help you ensure that you are not buying a boat that does not meet your requirements. ii) Make sure that all necessary paperwork is completed. iii) Help with the sale, liasing is done by the broker so no difficult phone calls or awkward situations with the vendor of the vessel. iv) Ensure that your money is safe. You can buy in confidence and know that your money is safe, and that it will not be released to the vendor until the sale is completed and the vessel is yours. v) Assist with arranging an independent survey or valuation, or any remedial works that may be necessary. vi) Offer viewing of boats available for sale. No meetings in the middle of no-where with someone you have never met before. A sale can be boken down into several easy steps. As Boats come in many shapes and sizes, never buy the first boat you like the look of that fits your requirements. Try and view as many boats as you can to get a full picture of what is available. Often you will return to the first boat you viewed, but invariably ou will never buy the right boat first time. 1. View as many boats as you can. Don't be afraid to ask, even it it may seem like a silly question. Any good broker is there to help. 2. When you find your "Dream Boat",' you should place an offer. Offers can be "as seen" or subject to survey or river trial. We will pass the offer onto the vendor and in many cases get an immediate answer whilst you wait. 4. Paperwork is then drawn up by us. At this point you and the vendor will enter in a contract and will be required to sign a Sales Agreement which confirms the terms of the offer, acceptance of the basic terms and the timescale to which the sale should follow. 5. The sale is usually competed within 7 - 14 days of the initial deposit. During this period, any surveys and river trials can take place to ascertain the quality and value of the boat. Should anything untoward be found, this will give you time to renegotiate the sale price or to retract from the sale. 6. The final paperwork will be completed upon cleared payment of the final balance. The boat & keys will then be handed over and you will now own your "Dream Boat". 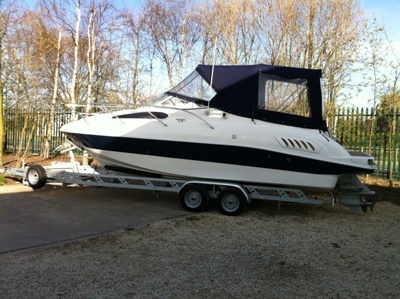 We will perform a hand over to you and explain briefly the boat and its equipment. If required we can take you on a short river trial. Sometimes this may be carried out by the vendor. 7. We can also offer advice with other matters such as Insurance, Licences, Breakdown Assistance and Moorings. If you have any queries about the sales process, please ask! We are here to help you, and make buying a boat the pleasurable experience it should be.